FCB South Africa is running an idea up the flagpole. A really big idea. In fact, the idea is ginormous. 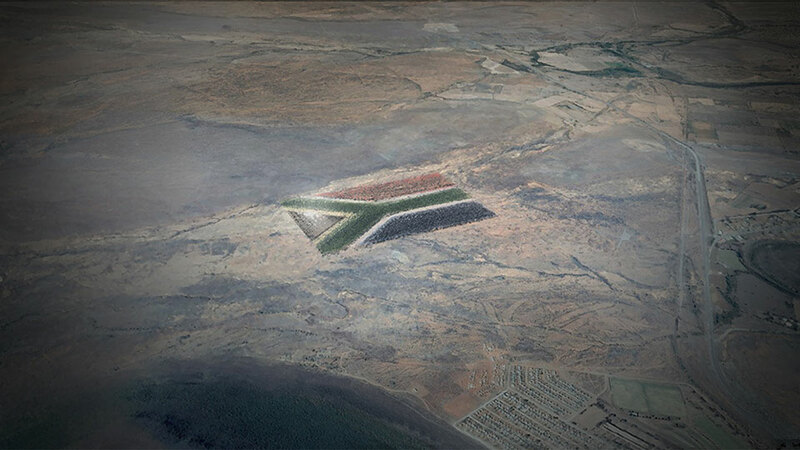 And its main component is a South African flag so large, it will be visible from space, 30 miles above the Earth. The Giant Flag project was put in motion last month by Guy Lieberman, the agency's head of green and social new business development. The initiative is ultimately designed to foster national pride, improve the lives of people in need and make a lasting impact on South Africa's economy and environment. "Yes, it is big. And it is wild," Lieberman tells AdFreak. "It's both an unreasonable project—in the good sense of the term—as well as a practical one." So, how big and wild are we talking? The proposed flag will measure 66 hectares—that's nearly 165 acres, about the size of 66 soccer fields. Its red, green, blue and gold sections will consist of millions of cacti and succulent plants that can thrive in the semi-arid Karoo region, offsetting some 90,000 tons of carbon emissions annually. Solar panels designed to power the equivalent of 4,000 homes will make up the flag's triangular black patch. (They will also "harvest" rainwater to feed the flag's living components.) The white areas will be access roads. The project will provide more than 700 jobs in Camdeboo Municipality, where the unemployment runs over 40 percent, and support tourism, hospitality and various enterprises over the long haul. Moreover, Lieberman says, it will serve as a symbol of hope, cooperation and sustainable growth for South Africa and beyond. But … where did the whole giant-flag idea come from? Lieberman drew his inspiration from the 2010 FIFA World Cup in South Africa, noting "the nation's huge emotional response to our flag." After the World Cup, FCB launched the much-praised "Keep Flying" campaign to encourage the nation to maintain its momentum. "The CEO of FCB South Africa [John Dixon, since succeeded by Brett Morris] called me into his office," Lieberman recalls, "and said that while the ["Keep Flying"] campaign was amazing, it was fleeting and we needed to look for a legacy project on the flag, something that could live on. And so the Giant Flag idea was born." Of course, a 66-hectare flag can't be built on the cheap. What's the price tag, and who's footing the bill? Crowdfunding and corporate efforts are under way. All told, it will cost about $20 million, with $2 million being the threshold to begin the massive germination project, followed by clearing the land, fencing off the site, building roads and constructing the solar field. "There has been half a million dollars sunk to date," says Lieberman, "and a variety of commitments, soft to definitive, of around $6.5 million." In a way, the initiative represents the confluence and expansion of two industry trends—agencies launching intellectual property efforts and creating installations designed to have a broader social impact. Many such projects have succeeded (including FCB's own fascinating billboards in Peru), but they have been far less ambitious, and staged on a more manageable scale. So, how does Lieberman respond to critics who say the Giant Flag is a grand idea, and great PR for FCB, that will probably never fly, owing to its cost, complexity and all manner of potential pitfalls? "I understand why they would say that," he says. "It's unlike anything that has come before—there is no easy framework for them to grasp on to. How could they possibly see it happening? But that's OK. The Giant Flag will happen. … There are too many people who can already feel it in the landscape."